Tags: Bill Perkins, Jaime Staples, Matt Staples, prop bet. Posted on Tuesday, March 27, 2018 by "T". 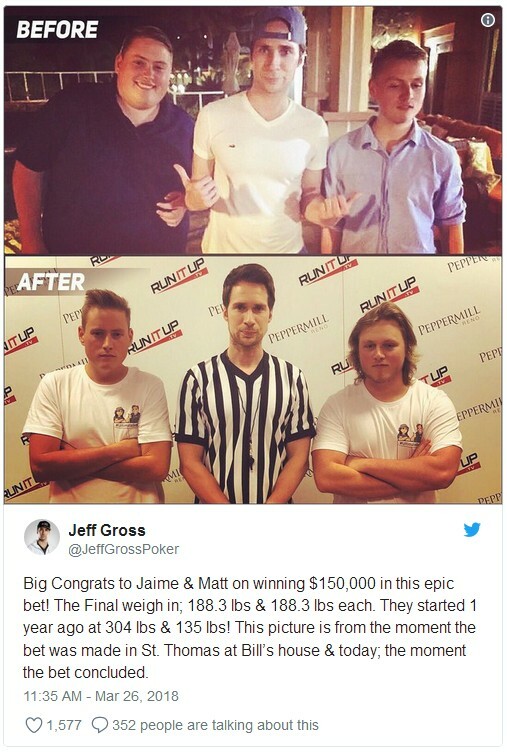 It has finally been a year since poker player and hedge fund manager Bill Perkins challenged Jaime Staples and his brother Matt to a lucrative prop bet - that both brothers need to get within 1 pound bodyweight of each other in one year in order to win $150,000. If they lose, they only have to shell out $3,000. Their initial weigh in was made 6 days after the bet, in which Jaime's weight was at 310 lbs (140 kg) whereas Matt was only 135 lbs (60 kg). 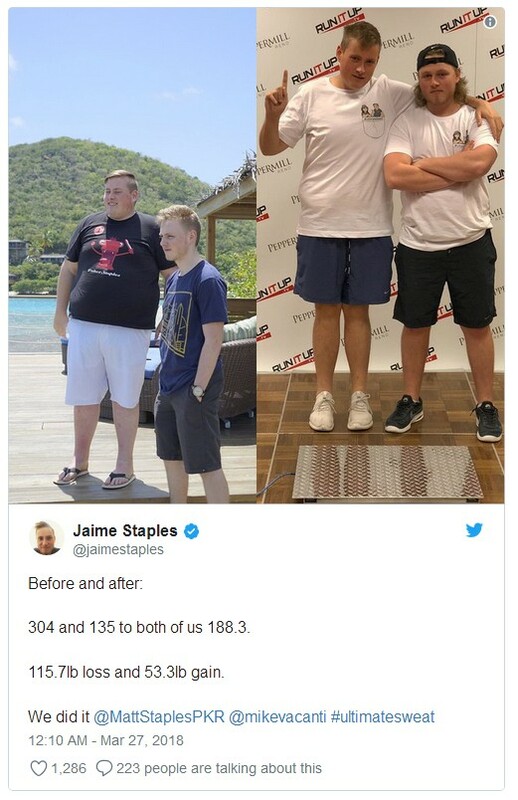 Fast forward to February 2018, Jaime was able to successfully lose 100 lbs, whereas his younger brother Matt, on the other hand, had to increase his weight so they could meet halfway. On March 25, 2018 Sunday, the momentous weigh in was scheduled. Jeff Gross, a friend of Perkins and also a PokerStars ambassador just like Jaime, officiated the proceedings to make sure that the weigh-in was legit. The younger brother Matt was weighed first at 188.3 pounds, 54 pounds more than his starting weight. Next came Jaime, who started his weight loss journey at an unhealthy 310 pounds, and as he stepped onto the scale, it matched his brother's weight - exactly! Not only Jaime's health is better now after the course of one year, but both he and his brother are now officially 150,000 richer! Matt and Jaime livestreamed their journey via Twitch, and over 10,000 viewers watched. Also, their personal trainer Mike Vacanti was present at the weigh in, and has been documenting the final days of their training on YouTube. Jaime Staples also announced their victory via his Twitter page, "We did it. We won the ultimatesweat bet and 150k. I feel so surreal right now." Many in the poker community expressed their congratulations to the brothers on social media as well as credit was also given to Bill Perkins for encouraging the once-obese online poker pro to get in shape. Perkins wrote, "Congratulations on your progress so far and a life long journey of health and fitness oh and also on winning a 150 Bananas." And so ends Jaime and Matt Staples' weight loss prop bet. If you wish to lose a massive amount of weight successfully, remember the name Mike Vacanti. If you wish to get rich by losing weight, contact Bill Perkins. 12 comments for "Jaime Staples and Younger Bro Win $150K Weight Loss Prop Bet from Bill Perkins"
ok for my untrained eye it actually looks like the fatter dudes has actually became the skinnier dude of the pair... lol nice challenge, I would have nothing against going after one similar myself if someone offered me 150k for my efforts. Congratulations to Jaime Staples and his brother on winning this amazing bet. We know that poker players sometimes make crazy bets, and this is a good example of those. Must be good for his heath! I'm glad because these brothers have won this bet and a lot of money. 150k for an interesting bet is very good for them. One of the brothers has to do regular sports and not start eating again chimicals, fries or another other poisons... Is the best for him. Congratulations for the beautiful gain, i think Bill Perkins is upset. Ohh man...where I could find some challenge like that? I´m specialist in up and down weight. I could have 30/40 kg of diference between winter and sumer. And for a $150000 prize I could do it better! If you are tall (I´m 1,90 mts) you could do it very easy. The problem will be if the weight up it´s measured as a percentage of body mass. But, for $ 150K I would do it! Wow, big congratulations to Staples brothers on winning US$150,000, and very well done to their trainer Mike Vacanti! I didn't expect they were going to make it when Bill Perkins announced the deal a year ago, to be honest. Not a big problem though if he ants to drop back where he was. 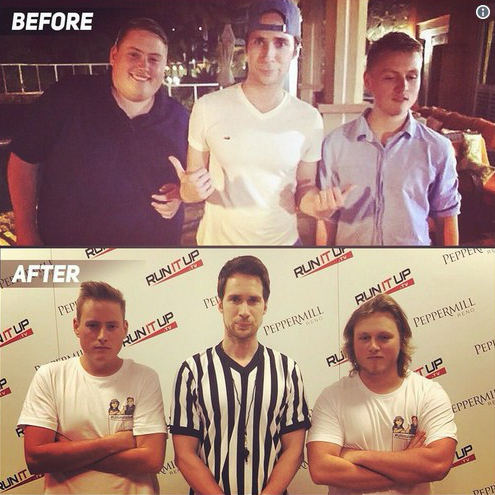 He was the taller to begin with so thats why he looks leaner now.